In March each year, the Queen appoints a new High Sheriff in Surrey. In theory, this man or woman is the Sovereign's legal representative in the county. In practice, today it is largely a ceremonial role, but one of the oldest in the land, dating back to Anglo-Saxon times (the name then was 'Shire Reeve'). The 21st century High Sheriff seeks to support individuals and organisations that uphold the criminal justice system, notably Her Majesty’s Judges. The High Sheriff has had historic links with law and order since the 10th century. That's what makes the High Sheriff Youth Awards so important today. They recognise that young people themselves play a key role in helping reduce crime and bad behaviour. By applying for an award to make your community in Surrey safer, you are continuing over 1,000 years of tradition. The High Sheriff of Surrey for 2018-2019 is Mr Jim Glover OBE. The badge he wears shows a green star with 11 points, one for each borough or district in the county. 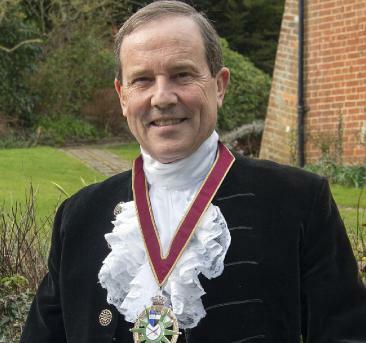 During his year, Jim Glover will actively promote the work of the High Sheriff Youth Awards throughout the county and the support that our charity gives to projects that help young people make Surrey safer. Additionally, Jim Glover’s priority is to support the professionals and charities working to reduce the number of pupils permanently excluded from schools across Surrey. When members of the Royal Family come to Surrey to visit people, projects and places, Jim Glover is one of those who welcome them. The historic Service for the Judiciary in October is one of many ceremonial duties during his year as High Sheriff. Wearing a distinctive and traditional High Sheriff's uniform, he leads a procession of Her Majesty's judges and magistrates through the centre of Guildford, so maintaining links with law and order in Surrey that go back more than ten centuries.